Howdy! You can count on us. Morning, evening, I'm your bus! Marilyn Singer's brand-new I'm Your Bus (Scholastic, 2009) does a great job of making those big behemoths seem friendly and even inviting. Hurry, hurry! Now it's eight. Busy buses, can't be late! Get on, Jamie, Carlos, Gus. Casey, Lacey, I'm your bus. Past the waving traffic cops. Past the friendly tire shop. Watch those backpacks! Coming through! Have fun today. Learn something new! Anthropomorphic buses, with kindly windshield wiper eyes and big smiles, wake up early to ferry the children through cheery morning streets, cheered on by their fellow taxis and trucks. They even watch over those items kids always manage to leave behind. The bus also reminds the kids that he's the one who'll drive them to special fun events--field trips to the zoo, the airport, the farm. And when the day is done, all gassed up and spiffily washed, the buses will roll up again to take the tired but happy kids home. The buses line up in a row. Find your seats and off you'll go. How'd you grade ME? Wow! A+! I'm so proud to be your bus! 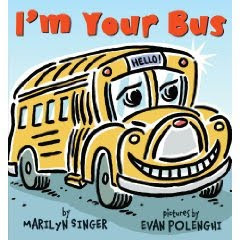 Cheery and rhythmic text and jolly illustrations by Evan Polenghi make I'm Your Bus a must-read for those first days of school. We reviewed this on our blog a few weeks ago too. My 20 month old picked it out at the bookstore and enjoys it. Buses have never been scary to him - he LOVES buses, and especially "yaya" (yellow) ones.